Fitzpatrick, Tim. "Reconstructing Shakespeare's Second Globe using 'Computer Aided Design' (CAD) tools." Early Modern Literary Studies Special Issue 13 (April, 2004): 4.1-35 <URL: http://purl.oclc.org/emls/si-13/fitzpatrick>. John Orrell's interpretation of Hollar's work as the product of minutely accurate topographic draughtsmanship (1983: chapter 4) has been one of the major factors which have led to the third Globe's being 100' in diameter. 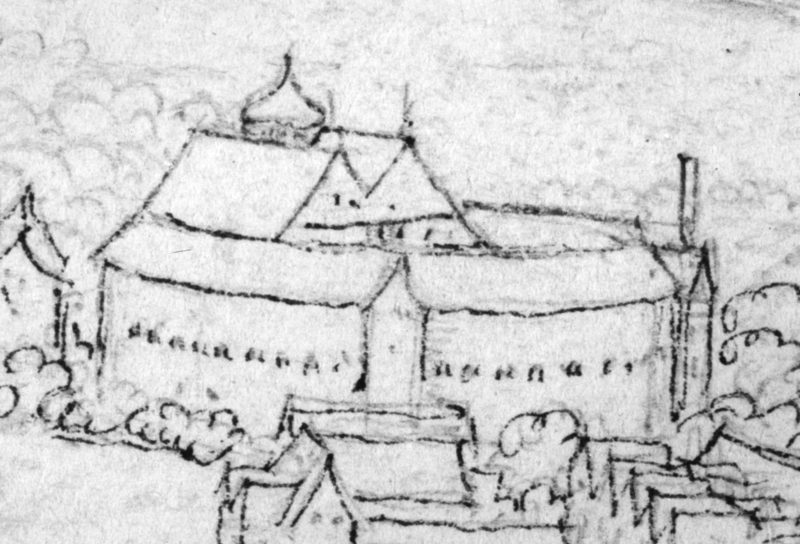 However in an article in Shakespeare Bulletin (1996) I argued that the second Globe playhouse which appears in Hollar's drawing might have been a smaller 16-sided ad quadratum building 86' in diameter. I outlined there the mathematical basis for such a proposal, argued that such a configuration would fit the archaeological remains, and suggested that Hollar's drawing is a partly inked-over pencil sketch, of no real use for calculations such as those done by Orrell. As will be demonstrated below, I believe that my dismissal of the topographic accuracy of Hollar's sketch is not the end of the matter, and that even as a sketch it might still reflect accurately some possible structural configurations of the building Hollar saw, thus offering invaluable information—if not about the dimensions of the building, at least about the geometrical and architectural relationships between its components. This article therefore describes an analytical strategy involving CAD in an attempt to account for significant features of the sketch and to subject it to analysis. I suggest that it is possible that the object which Hollar was sketching was a 16-sided ad quadratum polygon with two stair turrets equidistant from its main axis of symmetry, and a stage cover structurally integrated with the polygon; that such a theoretical object is consistent with the archaeological remains; and that Hollar's sketch may be an accurate rendering of such a building. Serious attention to Hollar's sketch began in the 1970s. Paradoxically, it has suffered multiple 'corrections' for supposed inaccuracies of detail, yet has been used as the basis for complex trigonometrical calculations as part of an attempt to establish the size of the original Globe. 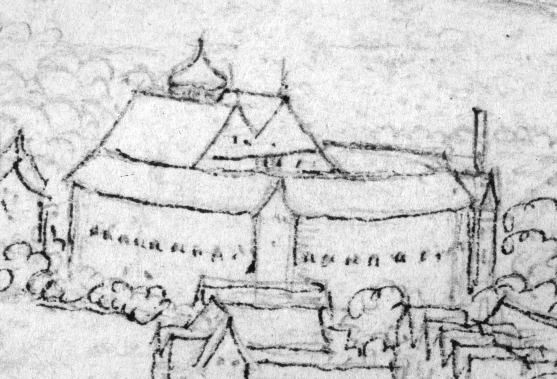 Substantial work on the sketch and subsequent engraving was done by C. Walter Hodges (1973) in Shakespeare's Second Globe: The Missing Monument, and by Richard Hosley (1981), both of whom suggested that Hollar's work was an inaccurate representation of the playhouse, particularly in regard to the positioning of the external stair turrets. However if the archaeological evidence (discussed in some detail below) is to be taken seriously, features of their work must now be questioned; I have discussed this in detail elsewhere (Fitzpatrick, 1999). The most radical interpretation of Hollar was that propounded by John Orrell in his 1983 book, The Quest for Shakespeare's Globe. He took over without question Hodges' projection (1983: 123) which would rotate the right-hand stair turret to make its façade invisible, but did not go into a detailed consideration of the polygonal configuration of the building as Hosley had done. Instead he continued a line of research concerned with the size of the building which Hollar has sketched. In 1981 Hosley (82) suggested the Globe must have been around 100' across, given that the height of the polygon to the eave-line is around 1/3 of the width of the building—and as the Fortune was 33' to the eave-line (and we might expect a similar height at the Globe) the Globe would have had a diameter of around 100'. Such thumbnail calculations (and the adjective is used advisedly, since that is roughly the size of the building in Hollar's original sketch) were both superseded and validated by the complex trigonometrical calculations done by Orrell for his 1983 publication. And herein lies his re-interpretation, a complete conceptual re-evaluation of the work: he argued that Hollar's sketch is an extremely accurate topographic drawing and, since this playhouse was most probably built on the charred foundations of the first, that conclusions as to its layout should also be relevant to the size and configuration of the first Globe (103, 121). However, as evidenced in a previous article (1996: 8-10), my first examination of the original drawing at the Yale Center for British Art in 1995 convinced me that Hollar's is not the topographic drawing Orrell believed it to be, but is rather a freehand sketch based at most on limited topographic sightings, disqualifying it as a basis for the sorts of complex and precise trigonometrical calculations from which Orrell arrived at a second Globe (and hence at a first and a third Globe) around 100' in diameter. Orrell has conspicuously avoided responding to these arguments in his response to that article, choosing merely to reassert his opinion that Hollar's is a "painstaking drawing" (1998: 5). I have now examined the sketch on three separate occasions, and subsequent examinations have only confirmed my original claim that this is indeed a sketch. A more detailed discussion of the implications of my most recent research is the subject of a forthcoming article, but in the present context it is relevant to present a brief summary of the issues. Orrell's claim that this is the carefully-drafted result of a multitude of sightings through a topographic glass ("a table of indexical signs, each line caused by a line in reality, each proportion answering to the proportions of the real scene." [1983: 75]) is simply unsustainable. A number of art historians with whom I have discussed the work agree that it simply looks like a sketch. In the most distant parts of the panorama the sketching is 'sketchy' indeed, buildings delineated with a few broad strokes. In the middle distance, where the Globe is located, the sketching is detailed and at times almost obsessively so; but it is clearly sketching, with the sorts of multiple passes evidenced above. There may be some topographic sighting, but tell-tale marks (such as I have suggested might be evidenced in the 'finial' markings on the Globe) are few and far between. Further impugning Orrell's interpretation are doubts about how the image which he claims was viewed and recorded through the topographic glass was transferred to the drawing paper. In The Quest for Shakespeare's Globe, he suggested that with drawing frames transfer was accomplished by correspondence between grid-lines on the frame and grid-lines on the drawing paper, but that with the glass another technique was used: sightings through the glass were marked directly on the glass itself, and then traced onto the paper by simply holding the paper, clipped to the glass frame, up to the light (1983: 22, 26; 1993: 7). Unfortunately neither the frame nor the glass techniques which Orrell outlines can have worked for the Yale object. Firstly, it shows no signs at all of having been gridded up to match grid-lines on a drawing frame. More importantly, it is extremely thick paper, and no amount of holding it up to the light will allow a traceable image on the glass to show through. Any such tracing would therefore have to have been done first onto fine tracing paper, and this traced image would then normally have been transferred to the heavier drawing paper by the common practice of 'pin-pricking' referred to by Martin Kemp (1990: 170, 176). The disadvantage of such an alternative process is that it involves two possible sites for transmission errors, rendering the final image less than authoritative—but, more significantly, such a process is not supported by the Yale original: there is no evidence of pin-pricks on Hollar's drawing paper. It is doubtful that any of the three scholarly interpretations discussed so far has been based on sighting Hollar's original at Yale, since some of the pronouncements made by their proponents are clearly the result of working from photographic reproductions. My previous article questioned John Orrell's characterisation of a number of creases in the paper as pencil lines (1996: 10). In Quest Orrell admits to not having seen the original, calling instead on the authority of Richard Hosley (1983: 101); Hosley might have seen the sketch at some point, but certainly not before his 1981 article where he suggests that some of the markings are "Stigmata caused apparently by a tear in the drawing" (1981: 90). In reality the marks he refers to are a combination of pencil and ink lines and a paper crease (feature L in Figure 3 below). C. Walter Hodges' interpretation of the relationship between the original pencil markings and the pen markings (as reported in Gurr et al, 1993: 12-13) does not indicate direct contact with the original drawing, since he ignores pencil lines that are clearly there, and sees independent pencil lines where there are none; this suggests he is working from a possibly degraded copy. While the authority of these scholars has given their pronouncements considerable weight, the paradox embedded in the received wisdom must cause concern: Hollar has given us an artifact of painstaking draughtsmanship, yet he errs unaccountably in important details. The following discussion will suggest that both parts of this proposition are problematical: I will argue that it is not substantially a topographic drawing, but that even as a sketch it offers invaluable evidence. Wenzel Hollar's two pencil and pen sketches, made in preparation for his renowned panorama of London, are now in the Paul Mellon collection at the Yale Center for British Art. They were made in the 1630s from a vantage point atop the tower of St Saviour's or Southwark Cathedral. One of them looks west and includes the second Globe. Hollar first used pencil in a process which I suggest shows characteristics of a sketch rather than a topographic drawing, and then inked part of the pencil sketch, with the ink markings not necessarily tracing accurately the pencil marks. He then did a second substantial redrawing of this 'original' for his engraved panorama, an operation which involved a change of point of view, with an anti-clockwise shift of the central axis of the building. The main structure is portrayed as a circular drum, though for various reasons we must assume that this is in fact an approximate representation of a multi-sided polygonal structure. I assume that the curved lines representing the roof ridges and eave-lines of the polygon (A, B, C, D) are 'inaccurate' in the sense that they are curved approximations of a series of straight lines that would make up the roof-sections of the bays of the polygon. We can also note initially, in regard to calculations of size, that there is some confusion at the left of the building: its multiple verticals (P) and three short 'base-lines' (S) offer no automatic indications of a 'correct' width and height of the building. Attached to the polygonal drum at various points are three rectangular structures: two stair turrets on its outer circumference, and a large stage cover attached at or near the outer circumference at the left of the drawing, and perhaps attached to the inner circumference at or near the mid-point of the yard. The angular relationships between the three rectangular structures are definable within certain limits: the stair turrets are separated by less than one-quarter of the circumference of the drum; we are looking almost frontally at the nearer one, which is close to the centre of the building as we see it, yet the facade of the right-hand one is obliquely visible. As can be seen in Figure 3 above, the angle (b) between the stair turrets seems in the range 60 degrees and 80 degrees. Second, the angle (a) between the nearer turret and the line of the M-shaped double gable seems in the range 40-50 degrees, and the point at which the stage cover connects to the outer circumference of the polygon is about a quarter-way or 90 degrees around from the nearer stair turret. Further, the central nick in the M-shaped double gable is almost perfectly aligned with this nearer stair turret: if our point of view has us looking through the side wall of the stair turret down a radius of the drum, then the central nick of the stage cover (G) is also very close to that radial, that is, very close to the centre of the building, the mid-point of the yard. This nearer stair turret is the most detailed part of sketch: the precision of both the tiling shown on the left-hand side of its roof and the shadow it is casting to its right on the polygon proper (E, F) suggests that it cannot easily be discounted as an error or aberration as has been the tendency. The exposure of the left-hand side of the roof indicates that this nearer stair turret is rotated or angled away to the viewer's right, despite the fact that it is at or very close to the centre of the sketched building (and therefore would be pointing directly at us if it were following the radial geometry of the drum). The remains excavated in 1989 established that the 'stair turret' foundations are not constructed radially off the junctions of the polygon, but square from the facades of the bay walls, and such a procedure would account for this nearer stair turret being rotated slightly away from the viewer. It would also account for the oblique visibility of the facade of the right-hand stair turret, since it, for the same reasons, would be rotated off the radial towards the viewer. I believe the attention to detail (roof tiling, shading) around this turret is due to three factors: the turret is central to the building as sketched and its highest point is precisely marked (possibly by topographic sighting); it is angled away from the viewer sufficiently to enable the sketcher to give a good account of it three-dimensionally; and it is a key to other features, since it provides secure starting-points for the curved roof-lines (B, C, D) of the main structure. For these reasons I believe that this nearer stair turret should be taken extremely seriously and placed high in a hierarchy of reliability in the sketch, in contrast to the anomalous sections in the sketch which will occupy us below. The sketch features two versions of the right-hand stair turret, representing different initiatives from the pencil phase of the process. There have been at least two attempts (A, B) to create the curve of the polygon's roof on the far side of the building. The higher of these two lines is much heavier than the lower one. This higher line terminates abruptly where it runs into a crease-line in the paper (H), and it is from this termination-point Hollar has made a first attempt to sketch the stair turret's roof ridge, gable-line and flagpole (J). A subsequent decision to privilege instead the lower of the two curving roof-lines has led to this first version of the turret being abandoned in favour of a re-drawing of the stair turret (K) lower down, aligned with the lower of the two curving roof-lines. This second, completed version of the right-hand stair turret has then been 'sacrificed' in the third, inking phase of the process. As Hodges suggested (Gurr et al, 1993: 12-13), a pencil-mark indicating the right-hand extremity of the polygon (L) has been ignored, and a new ink line (M) added to its right, resulting either in an impossibly shallow stair turret, or one that is further away from the viewer, its side obscured by the intervening curve of the polygon. The massive superstructure of the stage cover seems well-integrated into the geometry of the polygon, as indeed it must have been to achieve and maintain structural rigidity; the structural issues involved will concern us below. However the M-shaped double gable of the stage cover is inaccurate if it represents a symmetrical structure: the nick or 'v' between the two faces of the gable is not centred, which has the effect of unbalancing the facade and making the farther half of the M seem larger than the nearer section. The lines down to this central valley (G) are manifestly tentative: they seem to have no underlying pencil-line, and the slight bifurcation evident in the nearer component is the result of a tentative inking, then revised. In addition, at the left-hand end of the nearer ridge the two pencil-lines cross and 'overshoot' each other at the point of intersection (Q)—clearly they have not been drawn to a topographic sighting mark, but have instead been sketched. This is an important intersection (the 'top-left' corner of the building), and if such a key datum is the result of sketching rather than of topographic sighting one must seriously question Orrell's interpretation of Hollar's technique. Visible in the valley between the two roof-ridges is the problematic 'onion dome' (N). It is generally assumed to represent a lantern (and has been transformed into one in the final etching), but its positioning is mysterious. It is unlikely that its principal function is ornamental, since it is on the southwest side of the building, obscured from most points of view on the north of the Thames by the stage-cover ridges; its positioning in the valley between the roof ridges suggests it must have been of significant practical import, since it would have caused major drainage problems in wet weather. It will be suggested below that it served the important function of providing light to the back part of the stage, and this has ramifications for the shape of the stage that might be inferred by the structural considerations to be developed below. A further problem is created by a diagonal line under the right-hand side of the dome (O). Hodges (Design 13) understood it to be part of the dome structure (symmetrical with a similar line which seems to mark the dome's left-hand underside). Once again discussion below, based on the CAD research, may throw light (or rather shadow) on this line. Before progressing to an interpretation of what structural principles might underlie this unusual combination of architectural elements, it is necessary to address the question of the archaeological remains: how any such intuited structure would have sat on those remains will determine how it would look from Hollar's point of view, and such considerations will constrain our interpretation of the sketch and the form the basis for our design choices. Since the uncovering of important archaeological evidence in 1989, we are able to discuss somewhat less conjecturally than previously what the footprint of the Globe was. If we accept the assumption that the first and second Globes shared the same foundations, these remains are invaluable, enabling us to project various possible polygonal configurations and the structural relations to the polygon of the ancillary structures (stair turrets), and to establish the exact position and elevation of the building in relation to Hollar's point of view. The bay uncovered in the 1989 excavation has been the subject of serious discussion and not inconsiderable disagreement (Gurr et al, 1993: 20-52, 107-15). Its walls and junctions are sufficiently ill-defined as to permit a variety of dimensional interpretations, but precise enough to enable the elimination of a number of previously-championed configurations. It led to the definitive rejection of the 24-sided playhouse previously supported by Richard Hosley and John Orrell, and to the physical construction of a 20-sided 100' playhouse. My 1996 article suggested that one configuration not considered previously, a 16-sided 86' playhouse, has a bay which is close in dimensions to a bay of a 20-sided 100' playhouse, and is compatible with the archaeological evidence. John Orrell's 1998 response to those claims is substantially taken up with a trigonometrical demolition of that proposition and in particular of a figure there which superimposed a notional bay on the archaeological remains. However Orrell's formidable trigonometry has been deployed against a paper tiger, as he could have easily verified by contrasting that figure to Figure 4 below, which corrects the error—a correction he had already seen in a draft of an earlier article (Fitzpatrick, 1999). The slight error at the northern end of the projected bay in the earlier figure was caused by volatility in the computer graphics software used, a misalignment which an alternative software package has corrected. Figure 4 also contains important other information: the survey data indicates that the relationship between the excavated wall junctions and Hollar's point of view atop the tower of Southwark Cathedral is as follows: Hollar's line of sight from the tower to the inner wall junction runs at 280.5 degrees from true north (i.e. he was looking slightly north of west at the centre of the playhouse). Now since the radial of the polygon that would bisect the two arms of this inner wall junction (i.e. would form the southern side wall of the excavated bay) runs at very close to this bearing (at around 283 degrees), it would seem that this excavated bay happens to be the very section of the playhouse which lies closest to Hollar's point of view atop the tower of Southwark Cathedral. It is precisely for this reason that Figure 4 also includes a conjectural 'Hollar's stair turret', to indicate the putative position of the nearer of Hollar's two turrets. If this bay is the one closest to Hollar's point of view, then the turret which he draws almost at the centre of his sketch of the building (see below) must have been attached just here to the polygon. Such a suggestion is consonant with a further insight derived from the archaeology: the relationship of ancillary or lean-to structures to the polygon. The so-called 'stair turret' remains unearthed around the outer bay junction, though wrongly positioned (and too wide) to represent the foundations of either of Hollar's turrets, are a clue that such structures would have been built at bay junctions rather than on the mid-line of the bay as had previously been assumed by Hodges and Hosley. The excavations show no indications of foundations of a mid-bay turret on this bay facing Hollar's point of view, so the inescapable conclusion is that if Hollar was in any way accurate in his placement of the stair turret it must have been on the southern end of the bay in question, perhaps sharing a foundation wall with the other excavated lean-to structure. The right-angled rather than radial connection to the polygon (as shown in Figure 4) would make the stair turret angle away from Hollar's point of view by approximately 10 degrees (depending on the number of sides to the polygon). What the 'stair turret' excavated in 1989 might have been is not clear—perhaps it was a single-story entrance foyer for the yard and lower gallery, providing access as well to the upper galleries via a door in the side wall of Hollar's stair turret. If the 16/86 configuration can be accepted as not inconsistent with the fragmentary archaeological data, can a consideration of Hollar's sketch strengthen the arguments in its favour—and conversely can it serve to validate aspects of the sketch? Although an interpretation of Hollar's work as a sketch rather than a potentially accurate topographic drawing may seem to suggest that it is of little authority (or even, as Orrell seems to suggest, of no relevance at all: 1998, 5), this is not necessarily the case. An appreciation of Hollar's drawing as a sketch facilitates discussion, since various features that were frankly puzzling if it was a topographic drawing are simply explained if it is understood as a sketch. While I believe strongly that the Hollar sketch provides no viable basis for a calculation of the size and scale of the second Globe, I also believe that as a sketch it may offer other kinds of very significant information about the relationship and proportion of the constituent elements of the original object under Hollar's scrutiny from the tower of Southwark Cathedral (and hence of its more illustrious antecedent). With these considerations in mind I set about the task of establishing the extent to which Hollar's sketch, despite its sketchiness and the reservations heaped upon it by previous scholars, might stand up to rigorous analysis. To this end, with the invaluable assistance of Mr Russell Emerson, Technical Director of the Centre for Performance Studies, I employed computer-aided design (CAD) technology. This design tool supersedes in accuracy traditional techniques of geometric projection such as those used by Hodges, and (despite some inherent limitations which will be discussed below) enables the constructed building to be viewed in a variety of ways from various angles. If we made a series of assumptions about the structure and components of the building we believed Hollar was sketching, the CAD tool would enable us to compare precisely our preferred 16-sided 86' configuration with Hollar's sketch, and a substantial match might be some vindication not only of Hollar's accuracy as a sketcher, but also a partial vindication of our preferred 16-sided theoretical object as the most likely building that lay under his gaze from the tower of St Saviour's. Our procedure would therefore be to use CAD to build our 16-sided polygonal hypothesis, working out the locations of the stair turrets on the polygon (on bay-junctions, and equidistant from the building's axis of symmetry) and their relation to the stage cover (about 45 degrees around from the cover). We could then look at our building from a particular point of view: from data supplied by Dr Bill McCann of MoLAS we knew not only the bearing, but also the distance and relative elevation of Hollar's point of view in respect of the excavated remains. The distance from Hollar's viewpoint near the SW corner of the tower of Southwark Cathedral to the inner wall junction is 1181.683', and the relative elevation is 144.357'. Since CAD enables us not only to construct various configurations of the building, but to rotate and view them from any particular angle, we could build the Globe plus a line 1181'8" long emanating from the inner wall junction but diverging by 2.5 degrees from the bay-wall radial (see Figure 4), and connect this base-line to a tower 144'4" high (and add 5' to allow for Hollar's estimated physical stature). We would then be able to view one part of our 'building' (the Globe) from the other part (the top of the tower). In other words, rather than simply rotating our CAD version of a hypothetical Globe until we found a point at which it 'looked good' and corresponded to Hollar's sketch, we would be able to be more stringent and lock ourselves precisely into Hollar's point of view and establish the extent to which our theoretical object, viewed from his position atop the tower, corresponded to his sketch. If there were significant correspondence we would be able to argue that the two artifacts validate each other. Any attempt to get closer to an understanding of the structure and layout of the building which Hollar was sketching must necessarily make a number of assumptions, and it is important that the assumptions we have made be spelt out in advance. Firstly we assumed that the stage cover Hollar sketched was a symmetrical structure, the obvious asymmetry of the facade resulting from inaccurate sketching as C. Walter Hodges argued in 1973 (42). We therefore assumed that the axis of symmetry of the stage cover and stage lying under it is represented (though slightly inaccurately) by the valley between the two ridges, the central 'nick' of the M-shaped double gable. We also assumed that, whatever the number of sides to the polygonal drum, the two stair turrets were located symmetrically on its circumference in relation to this central axis of the playhouse as defined by this orientation of the stage cover. Further, we assumed that this stage cover was attached to structural elements of the polygon proper, i.e. to the existing bay junction posts on both the outer circumference (at rear) and on the inner circumference (at or near the downstage line, as argued by Hodges, 1973: 42), rather than being geometrically and structurally independent of the polygon. We also assumed that the second Globe had no jetties (since they had been outlawed in 1611: see Orrell, 1983: 122), and that therefore the resultant shallower upper galleries might not have needed to be as high as those specified for the Fortune; for this reason we settled on galleries of 12' (1' footings + 11'), 10' and 8' for a structure 30' high to the eave-line, or 3' lower than the Fortune. As we can see immediately, this configuration demonstrates that Hollar's treatment of the stair turrets is, pace Hodges, not to be dismissed outright. Though they are separated by a quarter of the circumference of the polygon, their square-on rather than radial attachment to the bay junctions rotates each of them towards the other, enabling both their facades to be visible. The nearer one is indeed rotated slightly away to the viewer's right to show the side of its roof, and the right-hand turret shows its facade obliquely, just as Hollar's inking suggests. The illustration here is minimally larger than Hollar's original, indicating both that it is possible to discriminate angles between the building's components even at this small scale, and that Hollar's miniature sketching technique is possibly excellent. Given that this exercise not only contradicted Hodges' redrawing of the right-hand stair turret, but also reinforced the viability of our hypothetical object and provided evidence of convergence between it and Hollar's sketch, we began to build our CAD object in more detail. The most complex of the structural issues to be addressed was that of the geometry and integration with the polygon of the stage cover: if we were undertaking the CAD construction of a coherent and integrated building we would need to find a logic and rationale behind the relationship between polygon and stage cover as portrayed by Hollar. Where and how might the cover have been connected to the polygon, what was its underlying structure, how was its span supported, and could such considerations lead us closer to certainty that Hollar might have been sketching with some accuracy one particular polygon with a structurally viable stage cover attached to it at four logical points? We have noted above the apparently rectangular structure of Hollar's stage cover and the probability that at the rear it is anchored to the outer ring of the polygon, while its front facade seems anchored to the inner perimeter of the polygon. If we consider our 16-sided ad quadratum construction (Figure 6), it is easy to see where such anchor-points would be: there are four posts, two on the outer ring and two on the inner ring of the polygon, which, thanks to ad quadratum geometry, are in a rectangular relationship to each other. (Figure 6. An ad quadratum ground plan, showing four potential anchor-points for a stage cover. But how would you build such a cover? It would obviously be impossible to span the more than 60' across the yard with a single triangular truss, which would put intolerable lateral stress on the polygon. Hollar's sketch indicates that the solution adopted was more complex: the M-shaped double-gable structure we see portrayed there is in reality better described as two overlapping triangular or inverted 'V' trusses (Figure 7). But what would lie under the trusses, how would they be supported, and what is the starting-point of the design? If we examine Figure 8 we see that one logical starting-point for any attempt to span this void would be one bay back from the front of the stage (that is, the thick dotted chord ab). Two overlapping triangular trusses along this line could be supported by posts at points c and d on the stage. Hodges (1973: 55, 64-5) noted the key importance of the beam one bay back from the diameter or downstage line, but argued less than convincingly that this massive superstructure could have been supported without stage-posts. If these stage-posts are positioned as indicated here, at the intersection of the chord ab and the radials marked as thin dotted lines, they would also (thanks to ad quadratum geometry) create a rectangle with two posts on the inner ring of the polygon, e and f, further reinforcing the rectangular structure. This possible positioning of the stage-posts is the first element in the jig-saw of the stage and its size and shape. With stage posts positioned thus we would end up with a central truss across the roof, one bay back from the downstage line, such as that shown in Figure 9. A logical next step would be to add a horizontal 'collar tie' (to stop the roof as a whole splaying laterally and collapsing downwards) about one-third of the vertical distance between the main beam (a beam more accurately termed the 'bottom chord') and the apex of the roof. Elizabethan use of quadrilateral roof-framing has been discussed by Stuart Rigold (1981: 122, 125), and we have adopted a number of vertical 'queen-struts' linking these two horizontal beams (they also act, and help the collar tie to act, to prevent the diagonal raking beams or upper chords sagging inwards). These struts and the collar-tie are shown as dotted lines. A similar truss would be employed at the rear end of the roof, whereas at the front gable a lightweight truss would suffice (see Hodges, 1973: 64-5) since most of the weight would be taken on the other two trusses, supported mid-span by the stage posts c and d and the posts e and f. The elimination of the bottom chord and the lower sections of the inner raking beams on the front truss (the dotted lines in Figure 10) creates a gable such as that clearly visible in Hollar's sketch. This raising of the 'ceiling' at the downstage line would also allow more light onto the stage. Both these front and rear trusses would be spanning a slightly wider distance than the central truss, so their outer raking beams would be slightly longer and meet the polygon lower down on the four anchor-points at the corners of the stage cover, as can be seen in Figure 11. This object, a revised version of the first, which now took into account these complex structural considerations around a stage cover integrated with the polygonal drum, was then constructed using Minicad CAD software, and the resulting image superimposed on Hollar's sketch. The result is shown in Figure 12. Once again, this image of the CAD object is viewed from Hollar's point of view, not from a point of view chosen because it would enhance the 'fit', and again one is struck by the significant correspondences. It shows (in blue) the front truss and its collar tie; behind it under the roof are plainly visible (highlighted in green) the diagonals of the main truss (this image does not include the detail of the queen-struts discussed above). However there is one notable discrepancy which led to the next phase of the project. The two parallel ridges of the stage-cover, in comparison to Hollar's image, kick up to the left. This is due to a CAD software limitation: its orthogonal projection shows accurately the size of a building's components so exact dimensions can be measured from the projection, despite the fact that they may be at different distances from the viewer (so that under normal circumstances perspective distortion would make the one further away look smaller). This means that the left-hand end of the stage cover is shown as the same size as the nearer or right-hand end, and causes the ridge to kick up in comparison to Hollar's rendition of the building (which incorporates perspective distortion to reflect the building as he sees it from his point of view). Accurate perspective projection (with the capacity to specify a particular distance from point of view to object) would overcome this, but our software did not have such a facility. Prompted both by the fact that the correspondences with Hollar's sketch were so remarkable, and by the limitations of the CAD software in regard to perspective distortion, we immediately took the next logical step of building, on the basis of our CAD plans, a 1:50 scale model of our building. Yet again we were able to view and capture the physical model from the precise angle and scaled distance and elevation of Hollar's point of view. The multiple image in Figure 13 shows the model and, superimposed on Hollar's sketch, a computer-generated line-drawing of the model. We believe that the correspondence between the model and Hollar's sketch is startling, and one notes immediately that the parallel ridges of the stage cover are now much more closely aligned with Hollar's. Note in particular that the stage cover as we have designed it enables us to see in under the collar-tie some of the infrastructure of the main truss one bay back from the downstage line. This infrastructure is represented in Hollar's sketch by a number of vertical lines, possibly representing the queen-struts from the major horizontal beam up to the collar tie as shown in Figures 9 and 11. This exercise provides one additional insight: when it is lit by morning sun so as to recreate Hollar's shading on the polygon to the right of the nearer stair turret, we see one possible explanation for the line O (Figure 3) in Hollar's sketch. The diagonal line below and to the right of the onion dome, considered by various scholars to mark the under-side of the dome or the (incorrect) far gable of the further ridge of the stage cover, may instead have been drawn by Hollar to mark the shadow-line created by the dome on the roof below it. It is also necessary to comment on the location and function of the onion dome, and in doing so we come to another factor which impinges on the possible shape and size of the stage in this playhouse: in the model the location of the onion dome is indicated by the polygon g in Figure 8. It is clearly at least partly behind the chord that would represent a straight tiring-house wall, and since it would serve no useful purpose in providing light to the tiring house (which could easily have windows on the outer walls of the polygon proper) we can only conclude that its main function was to provide light via a light well to the back of the stage, and that the stage therefore was deeper than usually thought, going back to a concave tiring-house wall which followed the cants of the polygon (as at the Rose: see Bowsher, 1998: 39, 50) rather than a straight wall such as that de Witt shows us at the Swan. The gloom cast over the stage by such a massive cover might well have provided sufficient motivation for the construction of a lantern in the valley between the two ridges, in a location that would surely have been problematical as far as drainage was concerned. Hodges rightly argued in 1973 that this curious superstructure must have had a serious function to be placed in such a problematical position (1973: 73-4). He too located the lantern forward and clear of the polygon in a position very close to that validated by our CAD design (43). However there are a number of discrepancies between the model and Hollar. First, the M-shaped gable of the stage cover: the model corresponds precisely with the near-side line in Hollar's sketch, while the farther side of the facade is slightly misaligned, a discrepancy easily accountable simply by the obvious inaccuracy of the sketching at this point. The second discrepancy concerns the two versions of the right-hand stair turret: in the light of Figures 12 and 13 Hodges' suggestion that this stair turret should be facing away from the viewer and requires redrawing seems unfounded, since Hollar's inking is both logical and possible. The third discrepancy concerns the right-hand end of the polygon: the model supports Hodges' contention (Gurr et al, 1993: 12-13) that the pencil line (L) in Figure 3 is a more accurate marker of the right-hand extremity of the polygon, and is therefore to be privileged over the ink line (M). The final and most significant mismatch between the model and Hollar's sketch concerns the height to the eave-line of the polygon. Our superimposition of the model on Hollar's sketch provides no indications of absolute dimensions of the latter: all our discussion has been about the proportion and configuration of the elements of the building as sketched by Hollar. We can say that the superimposition of the 86' CAD structure we have built on Hollar's sketch evidences a mismatch at ground-level. Our building is, as indicated above, 30' to the eave-line, and it still 'goes underground' in respect of even the lowest of the pencil-lines, hidden in the bushes, that Hollar has marked as the base of his building. If Orrell had applied such an important insight to this sketch as well as to the others he takes into consideration, he might not have pursued so relentlessly a trigonometrical approach to this one particular sketch. This important insight provides the basis for the substantial re-interpretation of Hollar's sketch undertaken above, and it can be argued that the Globe he has sketched exemplifies perfectly the discrepancy Orrell notes between accurate location and inaccurate scale. There are possibly certain key pencil marks based on a limited number of topographic sightings taken to locate the building in the panorama, but the artist has then created multiple versions of it, trying out various sizes in pencil—and then, in the first 'redrawing', inking only one of them. If this is indeed a sketch rather than a fully topographical drawing, then the process would have had at least three distinct phases: firstly the artist would mark some key high-points on the building using the topographic glass or frame (e.g. the ends of the roof ridges, the points of the stair turrets, the peak of the onion dome); secondly, having transferred those marks to his paper, he would sketch the rest of the building freehand in pencil (at some points providing himself with multiple choices); and thirdly he would 'redraw' it, inking over some of the pencil-marks to create the finished ink drawing. This redrawing would involve both choice (which of the multiple pencil-sketch marks are to be inked?) and memory--since for purely practical reasons this final phase of the process would most probably take place back in the artist's studio, and could thus be the site of inaccuracies. There is one important corollary of such a suggestion: any 'scaling up' by Hollar of the prominent landmark buildings in the panorama, once located accurately by the sighting technique, would normally take place outwards and downwards from the topographic sightings of the building's high-points to which his technique committed him. We will literally never get to the bottom of the sketch if Hollar was indeed systematically enlarging the building as he proceeded with pencil and pen, stretching it outwards and 'driving it underground'. This outwards and downwards enlargement might well be exemplified by the three pencil lines (S) in Figure 3 which tentatively mark various possible baselines for the polygon, and the bushes which hide our view of this baseline may have been Hollar's means of avoiding a commitment to a definite vertical dimension for the horizontally-enhanced building he was sketching. We might also note in this regard that the ridge-line of the roof of the building immediately in front of the Globe (see Figure 2) has been lowered substantially in the inking phase, perhaps to maintain intact the proportion of the visible part of the Globe. In summary then, this CAD and model-building exercise absolves Hollar from the charges of major inaccuracy which have been levelled at the sketch by a generation of scholars. It establishes that had the building Hollar was looking at been an ad quadratum 16-sided polygon with an integrated stage cover attached to the polygon as described, and with symmetrical stair turrets attached to the polygon at bay junctions, then it would have resulted in a sketch very similar to what Hollar has presented. There might of course be more than one possible configuration for the building which would look like this in a sketch, but on the basis of our CAD and physical modelling we would argue that it is quite possible and even probable that Hollar was sketching with considerable (but not uniform) accuracy an integrated 16-sided ad quadratum polygon such as that theorised and described above. An ad quadratum layout makes it possible to conceive a structurally viable and coherent building and stage cover which would seem to validate Hollar's sketching accuracy--just as Hollar's sketch would seem to validate its geometry. Bowsher, Julian (1998). The Rose Theatre: An Archaeological Discovery. London: Museum of London. Fitzpatrick, Tim (1989). "The Dialectics of Space-Time: Dramaturgical and Directorial Strategies for Performance and Fictional World". In T. Fitzpatrick (Ed. ), Performance: from Product to Process. Sydney: Frederick May Foundation, 48-111. -----. (1995). "Shakespeare's Exploitation of a Two-Door Stage: Macbeth". Theatre Research International, 20.3, 207-30. -----. (1996). "The Fortune Contract and Hollar's Original Drawing of Southwark: Some Indications of a Smaller First Globe." Shakespeare Bulletin, 14.4, 5-10. -----. (1999). (with Russell Emerson), "Reconstructing the spatial dynamics of 'lost' theatre spaces: Shakespeare's second, first and third Globe Theatres". People and Physical Environment Research, 53-54, 42-57. Gurr, Andrew (1992). The Shakespearean Stage 1574-1642. Cambridge: Cambridge University Press. Gurr, Andrew, Mulryne, R. and Shewring, M. (Eds) (1993). The Design of the Globe. London: International Shakespeare Globe Centre. Hildy, Franklin J. (Ed.) (1990). New Issues in the Reconstruction of Shakespeare's Theatre. New York: P. Lang. Hodges, C.W (1973). Shakespeare's Second Globe: The Missing Monument. London: Oxford University Press. Hosley, Richard (1981). "The Shape and Size of the Second Globe". In C.W. Hodges, S. Schoenbaum and L. Leone (Eds), The Third Globe. Detroit: Wayne State University Press, 82-107. Kemp, M. (1990). The Science of Art: Optical Themes in Western Art from Brunelleschi to Seurat. New Haven: Yale University Press. Orrell, John (1983). The Quest for Shakespeare's Globe. Cambridge: Cambridge UP. -----. (1993). "The Accuracy of Hollar's Sketch of the Globe". Shakespeare Bulletin 11.2, 5-9. -----. (1998). "The Size and Shape of the First Globe: Interpreting the Archaeological and Mathematical Evidence". Shakespeare Bulletin 16.3, 5-8. Rigold, S.E. (1981). "Appearance and Reality: A Carpenter's Viewpoint". In C.W. Hodges, S. Schoenbaum and L. Leone, (Eds), The Third Globe. Detroit: Wayne State University Press, 117-135.